The bus runs six minutes apart. Which is rather glacial compared to our bicycles. Every split second in the rush hour, it seems. And every during the day, it's every few seconds or so. And don't worry... that may look like a tight squeeze, but she's on a separated bicycle lane there. 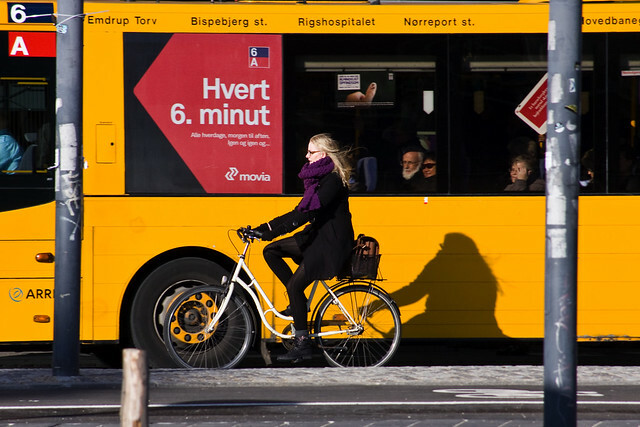 Would you say it is true that Copenhagen hasn't had to install an expensive tramway system because of the high levels of cycling? I love how the people on the bus are looking at her with joy! Great Shot!! simon: we used to have trams. for most of the 20th century. they were dismantled in the early 1980's, at the tail end of car-centric urban planning. the trams were the backbone of our public transport net. there are calls for reimplementing them. I just assumed that Copenhagen had trams and I was shocked to learn the Metro was only built in the 2000s. But that makes sense. The United States dismantled its trams from 1930s-1950s. Separate bicycle lanes... now there's a sign of a civilised, sophisticated society!